One of NYC's longest comedy and music shows produced by Ann Design and Fiona Walsh at the Irish Arts Center. Just cause they are not out to get you, doesn't mean they are not out to get us. It's kind of a perplexing one really as every beginner coder ever since the dawn of coding in DOS language has used as their initial lesson to print "Hello World" to screen. I did n't know a much used phrase could be captured and owned forever. That is the future, one where the IP ownership of everyday objects that were assumed to be held in common will become 'private property' of an individual; and a corp.
You own what? And so now I can't say "... "
I understand conceptually but it feels complex & weird to get a notice to get off using the phrase 'Hello World' . A bit like the bewilderment of the Indians might have felt when they were told cause they didn't have a deed for their common land that it now it belongs to Mrs White of Idaho™ and they can get off somewhere else. Being told to go because of IP laws is a whisper something similar to the native Irish being told to "Hell or Connaught™" c/o Mr Cromwell or having the real Cadbury's Milk Chocolate being declared illegal here in USA. Now there's no land countries left to colonize, so some next thing is to own and grab Intellectual property IP like 'language' or phrases within the language. It is a new digital territory. Hold onto your choice phrases folks or re-learn your Irish so you will at least have something to say about it all. 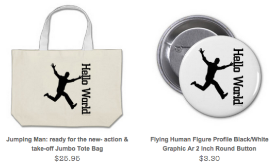 Get the last of the mugs and buttons! The IP 'death creatures' overlooked a few of my treasures - you would be a mug to overlook them too! Good news temporarily there are still a few small things they have not got around to killing off - like a mug, a button and a tote bag... so if you felt like supporting my art ... now might be the only time to get a one off collectors piece - It could be your penny black or just something you drink coffee from; you decide. 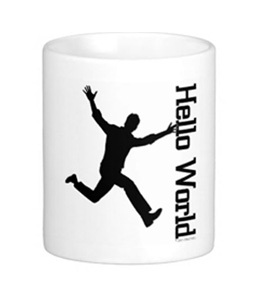 Mug: - leaping_man_mugBonus Discount: - Bonus discount code for $5.00 off your next purchase of $20.00 or more: UQGGPMRSLKJRBBQFLGBT.This code expires on 11/9/2015. Barrys' or Lyons Tea in this gleaming Mug is a perfect addition to the minimalist subway tiled kitchen. This mug, a coffee pot and one solitary spoon. Double up the details if you have a friend come by - which is kinda nice. 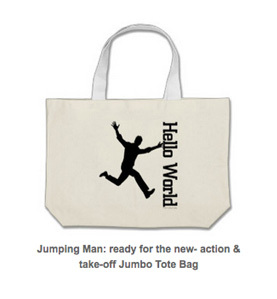 'Jumping Man' and Hello World! graphics. Loads of room in this sturdy tote for 'just nipping down to the shops!' and coming back with everything you want. You could probably hide a keg of beer in this bag and no one would notice. But a bottle of wine might be easier to carry.